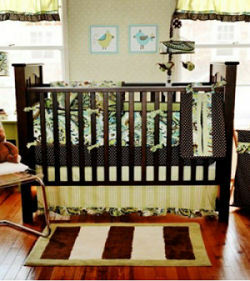 Paisley baby bedding and decor has proven to be delightfully innovative as well as a pleasant surprise in versatility. When it comes to decorating, I have come to find that my preconceived notions and lingering mental associations can be a liability. This has certainly been the case in my failure to recognize the possibilities for this particular print. I never realized what potential lay hidden within those swirling patterns and fanciful designs that reminded me way too much of the protozoa we used to look at through the microscope in biology class. I've been slow to catch on but I'm not too late to jump on the boat! By now you're probably wondering what about paisley baby bedding finally pushed the image microscopic organisms out of my brain long enough to imagine them in a decorating project. The answer to that question is a pretty collection of pink and green paisley baby girl bedding. Pink and green paisley nursery bedding is a breath of fresh air in a baby girl's room. 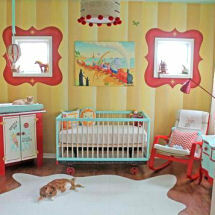 It's as feminine as a brown and blue paisley crib set in a baby boy's nursery can be very masculine. The crib skirt of this baby bedding set is made of striped fabric while the rest of the collection is either in solid blue or brown and paisley pattern material. The stripes seem to "ground" the swirling print. The combination of those particular colors with the paisley designs is fresh and pretty without being floral. In my opinion, that characteristic alone is a perfect selling point for paisley baby bedding sets as I often come across a customer with no taste for flowery fabrics that wants a soft and feminine look and feel in the baby bedding that will inevitably set the tone for the rest of the room. I've found that often paisley baby bedding has the best balance of softness and femininity (without having to convince mom and dad to consider floral patterns and lace trims that they specifically said they wanted to avoid) that I might ever have hoped to find for the baby girl nurseries that I decorate and as we see, it works very well in a masculine room, too! Please make plans to visit us again soon to see the latest baby nursery ideas in paisley for your little one's room. Example: Where did you get your decorating ideas? What was your inspiration? 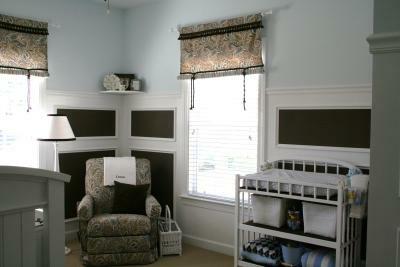 Tell us about your baby bedding and decorative accessories from ceiling to floor. submitted by moms just like yourself!